Interview with "Spinnortality: Cyberpunk Sim" Creator Jamie Patton! Bandersnatch + Happy Neofeudal New Year! Silver Spook Cyberpunk Christmas stream! + New Discord! Neofeud 2 Art + Sale! Neofeud Sale Ends in 10 hrs! Neofeud on Halloween sale 3 more days! New Cyberpunk Stories Released! + New Computer! Johnny Mnemonic Original Series + Other Cyberpunk Brainstorms! Neofeud Sale Ends In 6 Days! Neofeud 1 Year Anniversary Sale! 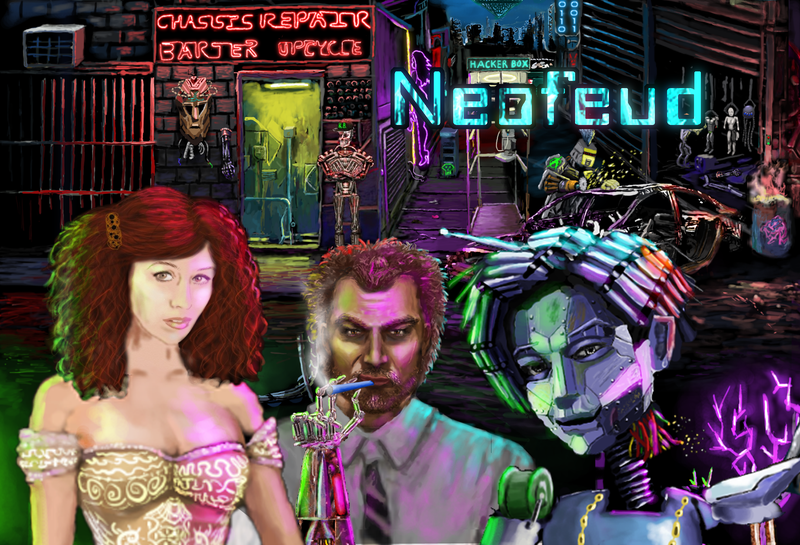 Neofeud Updates + New Cyberpunk RPG Project! Neofeud 50% today, flash sale! New Cyberpunk RPG I'm working on! Neofeud in top 25 cyberpunk games! Yay! Brand New Silver Spook Cyberpunk RPG Reveal Tonight! Neofeud 50% Off This Week! Silver Spook Live - With Neofeud 2 Excerpts! Neofeud Live Sun 12 Pacific! Sale Ends In 5 Days + Streaming Tomorrow! Business Tips For Indie Devs + Game Recommendations! Livepainting Neofeud 2 + Awesome indie games to get! Neofeud featured in Polygon + Summer Sales! Neofeud in a Polygon article! Neofeud 2 Painting Stream Tomorrow! "The Cospauper" performed by Princess Sybil! Streaming From Active Volcano Tomorrow! Neofeud Short Story Collection Up On Itch! Neofeud Soundtrack on Spotify, iTunes, etc! Neofeud Soundtrack - "Best Music" winner AGS Awards 2017, now on Itch! Silver Spook Podcast #19 - Space Quest Historian! "A Flying Car In Every Zone!" Silver Spook Live #40 - Neofeud 2 City Sneak Peek! Silver Spook Live #39 - Greenscrapers And Aircars And Everything Nice! Let There Be Flying Cars! Neofeud 2 Peek + Silver Spook Reviews Altered Carbon! Neofeud Up For Nomination In AGS 2017 Awards! Silver Spook Birthday Party Stream! All Podcasts In Audio Format + Updated Demo! Silver Spook Podcas #14 - Dave Gilbert of Wadjet Eye Games! Neofeud, A "Top 100" Finalist, Featured on Funhaus! Happy Cyberpunk Holidays and Thanks For Voting! The Space Quest Historian Plays Neofeud! NEOFEUD IS A TOP 100 FINALIST! VOTE NOW! 20 Hours To Vote For Neofeud! "A much more complex world than what is shown in Blade Runner"
Neofeud for "Indie of the Year"! A Cyberpunk Thanksgiving! You're Invited! Silver Spook Live - Cyberpunk Bartending! "Neofeud is a dystopian cyberpunk adventure that needs to be experienced"
Silver Spook Cosplays a Character From Neofeud! Neofeud is 34% off this week! Neofeud Featured In Hawaii Print Publication! Neofeud Is 33% Off This Week! Neofeud is 20% off this week! Silver Spook Live This Saturday!